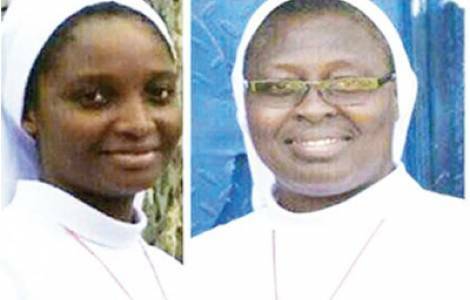 Abuja (Agenzia Fides) - "We are happy; to God be the glory", said Sister Agatha Osarekhoe, Superior General of the Sisters of the Eucharistic Heart of Christ, announcing the release of the three sisters and three reverend sisters abducted on 13 November 2017 in the State of Edo, in southern Nigeria (see Fides 18/12/2017). "One was said to have been released on Saturday, 6 January while the others on Sunday 7. Now they are fine. They are receiving some medical check-up in a hospital", she said. The first to be released was Veronica Ajayi, around 6 pm on Saturday 6 January. The three sisters, Sister Roseline Isiocha, Sister Aloysius Ajayi, Sister Frances Udi, were released along with two others on Sunday, January 7 at noon. On November 13, the six religious women had been forcibly taken by some armed men who had invaded their residence in Iguoriakhi. The criminals went away with six of them in a speed boat. According to the local press, the kidnappers were said to have later demanded a ransom of N20 million (about $ 54.00). However, the Superior General stated that no ransom was paid: "No ransom was paid. We know that the Police did their best because they are aware. They had to do their work. The most important thing is that our sisters are free". The police commissioner, Johnson Kokumo, said that the sisters were rescued during an operation by policemen from the command. “Police operatives closed in on the daredevil kidnappers and they had no other option than to release the reverend sisters".